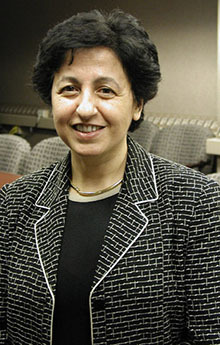 Elisa Bertino has received the ACM SIGSAC Outstanding Contributions Award for her seminal research contributions and leadership indata and applications security over the past 25 years. In addition to her role as CS professor, Elisa also serves as Director of the Discovery Park Cyber Center, and as Research Director of CERIAS. Elisa has conducted research addressing several critical problems in data and application security, including access control, data trustworthiness, data privacy enhancing techniques, data protection from insider threat, data security on the cloud, secure provenance and digital identity management. She explains the impact and importance of her research in the era of big data and the Internet of Things. "My past and recent research focuses on protecting and assuring privacy of information which is a critical requirement in today's era of big data and Internet of Things,” Elisa said. “The techniques that I am developing with my research collaborators will provide ground-breaking approaches to address current and new challenges in reconciling security with privacy and in ensuring a privacy-preserving use of big data," she added. She has extensively served the research community in various capacities, such as program chair and program committee member of prominent security conferences. In addition, she is currently serving as editor in chief of IEEE Transactions on Dependable and Secure Computing and is an ACM Fellow and an IEEE Fellow. Elisa also is a recipient of the IEEE CS Technical Achievement Award and of the IEEE CS Kanai Award. Elisa and her research team have recently made pioneering contributions to the area of data and application security and privacy, including the first application-level data anonymizer for Android, defense techniques against Return Oriented Programming (ROP) attacks on drones, and efficient encryption schemes for smart power meters, mobile devices and drones.